I recently wrote a post about the young Dinnis children born to John and Charlotte during the mid 1800s. The second child born was their first son – John Henry Dinnis, born in October 1843 and baptised at Brighton Chapel Royal on the 22nd November 1843. The family were living in Middle Street, Brighton at this time, by 1850 they had moved to the Old Ship Shades, Ship Street and by 1861 they were living in Steine Street at the Queens Head. John Henry was 17 by this time and although no occupation is given for him it seems logical to assume he was helping his father as a Cook and Publican. Ten years later in 1871 John Henry was 28, and lodging in St Mary, Islington, London. His occupation is listed as a Cook. There was another lodger in the house, whose occupation is given as a Clicker. This is a person who worked in the shoe trade cutting out the uppers for the shoes. Six years later, on the 21st July 1877 John Henry married Jane Catherine Evans. 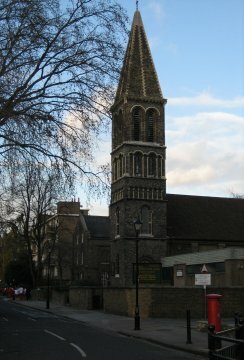 The wedding took place at St James the Less, Bethnal Green, Middlesex. There are two witnesses signatures – George Dinnis and Charlotte Harriet Dinnis, brother and sister of John Henry. There was also a St James the Great Church in Bethnal Green, which sounds grander than St James the Less, but this is not the case. St James the Great abolished the wedding fees in order that more of their parishioners should marry instead of cohabiting. St James the Less served a more upmarket area of Bethnal Green and is still open for business. Sadly the life of John Henry doesn’t have a happy ending. Less than three months after his wedding he died. His death is registered on the 6th October 1877 at 37 Albion Grove, Islington aged 33. The cause of death was Pulmonary Consumption. The informant was his brother-in-law, Fanny’s husband, who was present at the death and lived next door at 39 Albion Grove. His widow, Jane Catherine, went to live with John Henry’s parents and sister in Camberwell. This entry was posted in Charlotte Harriet Dinnis, George Dinnis, John Dinnis, John Henry Dinnis and tagged Brighton. Bookmark the permalink.